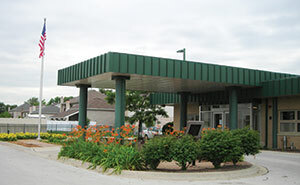 Never been to the Senior Center? Been here, but don’t really know all that it has to offer? 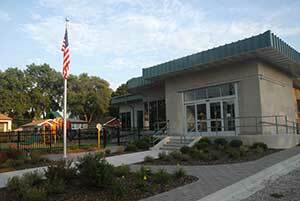 Come in any Wednesday morning at 10 a.m. and get a guided tour by a member of the Senior Center Advisory Council. No appointment needed. Just check in at the front desk by 10 a.m. on any Wednesday morning. New Senior Activities Have Arrived for the Senior Center at the North Clinic Building! 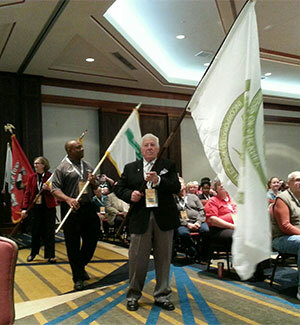 Tony Guleiva carrying our flag at The Parade of Flags at the 2018 Township Officials of Illinois meeting in Springfield. Did you know that Temporary Placards can be issued to Stickney Township residents with a temporary disability? More information here. The Stickney Township Office on Aging is offering The Caring Crew Luncheon once a month for any caregiver or caregivers caring for someone with Alzheimer’s disease and dementia. Enjoy fellowship, participate in educational programs and gain knowledge on topics that assist family caregivers. Lunch is provided and your care receiver is welcome to join as well. 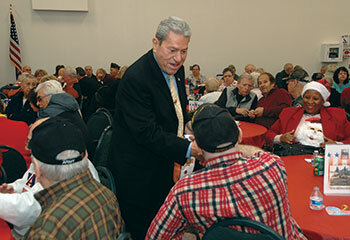 Each year, on December 7, the Township recognizes area veterans with luncheons and entertainment at the North Clinic Building and the LSV Senior Center. 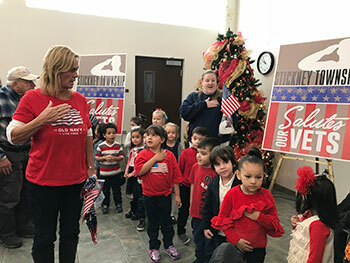 The 2018 event featured musical entertainment as well as participation from children in the Pre-School programs. The Stickney Township Community Fair is hosted yearly in the fall as a way for local businesses to share their valuable information to older adult members of our community. 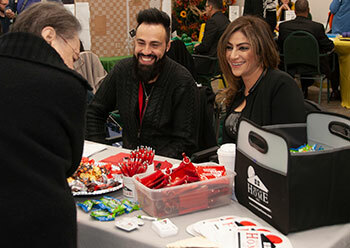 Health screenings, vendors and a speaker were provided on "Aging is about the Journey." 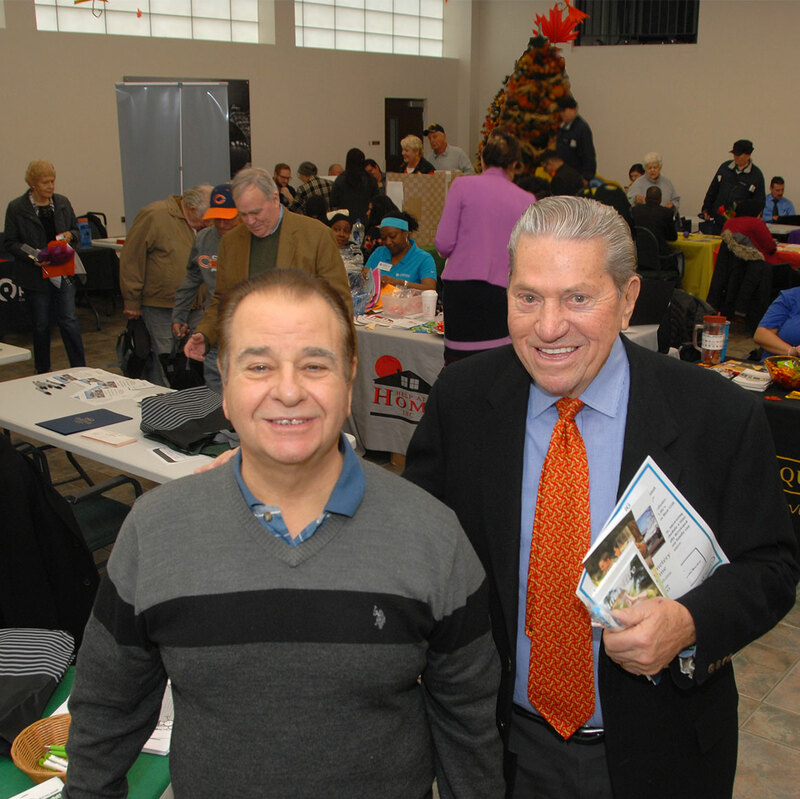 Township Clerk Hector Cesario and Township Supervisor Louis S. Viverito (above) joined Senior Center staff in welcoming the businesses and seniors. 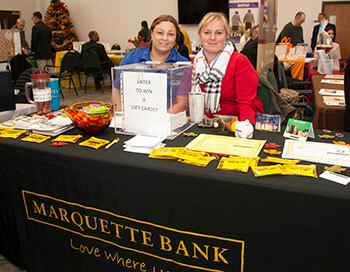 More than thirty area services and businesses were represented. 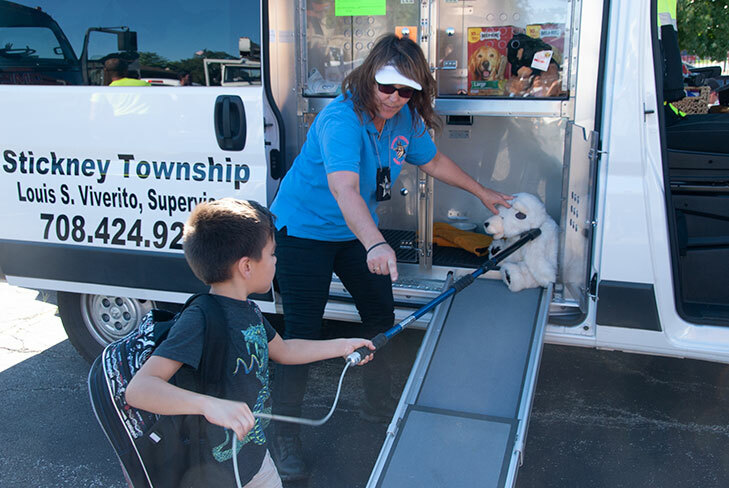 Township Day 2018 - Frozen Custard, Trucks and Teddy Bears, Oh MY! 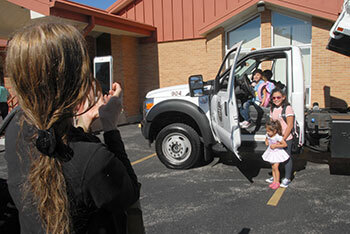 Township Day took place at the Central Stickney Community Center on September 12 and, as promised, gave Kids a close up look at vehicles from the Highway Department, Animal Control and mosquito abatement. In addition, staff from various Health District and Township departments were on hand to provide information in the community room. More photos to come, so watch this space! Deb Krohn, aka The Frog Lady, is more than a Frog Lady. She's a snake lady, a turtle lady and a reptiles-in-general lady! 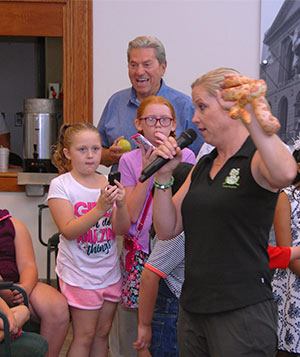 She travels around the area doing educational presentations about reptiles and stopped by the Louis S. Viverito Senior Center for last year's Grandparents Day. She showed off her lizards and snakes to the kids and seniors. Judging by the lines to get up close both Deb and her friends were a hit! Shovels hit the ground in Burbank on April 2, 2018 for the official groundbreaking of the Melvina Ditch Reservoir expansion project. The expansion is designed to provide much needed flood relief to both Burbank and Oak Lawn. 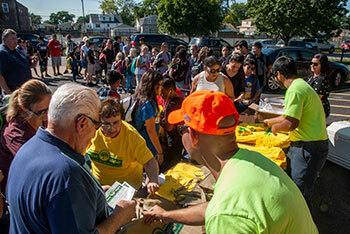 “Today’s groundbreaking represents the culmination of an engaging public process that relied on the input of Burbank and Oak Lawn residents to work toward a solution to severe flooding in their communities,” said MWRD President Mariyana Spyropoulos. Construction is now officially underway on the reservoir, 6500 W. 87th St., Burbank, and is anticipated to be complete by 2020. The MWRD will remove more than 80,000 tons of dirt to increase its holding capacity by nearly 64 million gallons. The $20-million project, funded primarily by the MWRD, also recieved a grant from the State of Illinois through it's Build Illinois Bond Fund. Area officials, including Stickney Township Supervisor Louis S. Viverito, were on hand and applauded the project. "I'm extremely excited and proud to think the MWRD is going to help Stickney Township, the City of Burbank and the Village of Oak Lawn solve their flooding problems," said Viverito. "You can't believe the people who would come to me crying and upset that they were flooded. 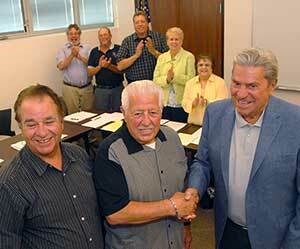 This is going to be great for the residents and businesses of Burbank and for Oak Lawn." Additional work on the reservoir will include the installation of a stormwater chamber and culverts at the outlet of the pumping station. Contruction will extend to 87th Street to install the culverts and replace any disturbed utilities. Storm pumps will also be removed and serviced and impellers will be lengthened. Downstream communities, such as Bridgview, Chicago Ridge and Worth will also benefit indirectly from the reservior. The Little Company of Mary Health Education Center offers Wake Up Call Screenings one Saturday each month from 7:30 am-noon. This one hour comprehensive screening for stroke and heart attack could save your life! Includes CBC, chemistry panel, cholesterol panel, thyroid level, liver enzymes and more. Ultrasound of the abdominal aorta and carotid arteries, peripheral vascular screening, heart rhythm screening for atrial fibrillation. NEW this year!!! Screening for metabolic syndrome. Includes personalized visit with the wellness nurse educator. Fee $155 (value $4,000). By appointment only. Payment required at time of registration. First appointment at 7:30 am. To register and for more information call 708 423-5774. 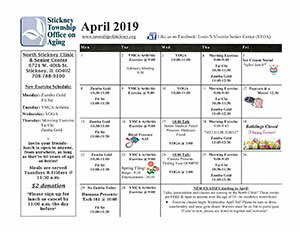 View the latest issue of Stickney Township News & Views here. Since it's dedication on Veterans Day 1999, the Stickney Township Highway Department has maintained the Veterans Memorial located in Burbank. The Township is proud to oversee this year-around tribute to our area service men and women. Michael Lenox, the man behind the Stickney Township Chess Club, was recently honored with an award from the United States Chess Federation. He was named Accessibility and Special Circumstances Person of the Year for 2018. 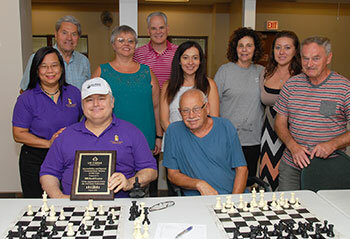 In addition to his participation in the US Chess Accessibility and Special Needs Committee, Michael serves as a Board Member of the Illinois Chess Association and is the Founder and President of Illinois Chess Vets. Trustee Tony Guleiva recently received the Melvin Jones Award for his humanitarian efforts in the community from the local Lions Club. He was congratulated by his fellow elected officials and Supervisor Louis S. Viverito at the July Township Board Meeting.